Arizona State University isn't satisfied with the state of adaptive courses. That's why this innovative university is going all in with adaptive degree programs. Adaptive technology is nothing new to Arizona State University. The Tempe, AZ-based institution began using adaptive courseware beginning in 2011 with math. According to Dale Johnson, adaptive program manager within ASU's EdPlus, the school was seeing a 50 to 55 percent student success range, "which is pretty typical throughout higher ed for college algebra and college math — and we wanted to do better." A college algebra class began testing Assessment and Learning in Knowledge Spaces (ALEKS), a McGraw-Hill product that uses adaptive questioning, enabling the success rate to rise by 20 percentage points. That ed tech eventually was built out in a number of other disciplines, including biology and chemistry, physics, economics, psychology and, most recently, even philosophy. Adaptive experimentation in general education courses has included the use of McGraw-Hill's LearnSmart (part of Connect); Pearson's MyLab Math and Mastering Physics; CogBooks' CogWare for history and biology; Cengage Learning Objects for psychology and economics; Smart Sparrow's Habitable Worlds; and Knewton. Now Johnson and his crew are pursuing a new and ambitious goal: developing a complete adaptive undergraduate program dubbed the "Adaptive Chassis." In this interview, he explains what the Adaptive Chassis is and why he believes this is the closest education has yet come to "mass personalization" of learning. Campus Technology: The "Adaptive Chassis." What the heck is that? Dale Johnson: This is a first-of-its-kind vertical integration. What we've decided to do is take the benefits of [adaptive] technology to a fully integrated program for a bachelor of science degree in biology. And we're going to integrate all the instructional resources from first year to fourth year into CogBooks. That's the partner that the School of Life Sciences has decided to use. That holistic approach differs dramatically from our general education approach. It requires more alignment between courses. In our traditional model, each course was its own island — even to the point where each section of each course may have been its own island. We have five sections of ecology with five different faculty members. We may have had five different versions of that course. We're aligning all of the learning objectives in those courses, then we're integrating all of the instructional resources, and, finally, we're going to personalize the learning process for each student in that learning program. That effort is about 50 percent complete. We launched the first five courses this fall. We're working on the next five. And what we expect is [that] entering students this fall will be able to grow into the "BioSpine." Their experience will be marked by an integrated, aligned, personalized learning process — in contrast with the fragmented, isolated and often mass-produced model that we traditionally use. Johnson: That's the first iteration of the Adaptive Chassis. It's a marketing term we coined to help faculty and students understand what we're doing. Think of the BioSpine as the infrastructure for this Adaptive Chassis. If we push the human metaphor all the way, the BioSpine is the alignment of all the learning objectives; CogBooks is the nervous system in the body; the instructional resources are the skin and muscle structure; and the faculty are the brains. We've used that metaphor to simplify what is a very complicated idea and to give them a little confidence that we're putting it all together in a logical way. One of the challenges here is getting faculty, who are traditionally cloistered and very individually oriented around their specific course section, to think collaboratively and to look at this as a collegial effort — to get all of these courses aligned into the BioSpine. CT: Faculty buy-in would be a big deal. Johnson: The School of Life Sciences has hired a full-time program coordinator to do that. His name is Joshua Caulkins, and he has been on the job for about eight months now. He's been actively working with faculty and with us to build this infrastructure. We found that the School of Life Sciences was very eager to move forward. They've been doing versions of active learning and problem-based learning for the past 10 years. When we brought the idea to them, they were already very excited about this pedagogy. And what the adaptive courseware does for them is accelerate their development of what they really want to do with students, which is teach them how to solve complex problems. We work closely with our colleagues at CogBooks to integrate all of the instructional resources into their technology. Let's say a third-year student is struggling with a concept that they first learned in their first year. The ideal situation is that CogBooks will remediate them back to that lesson and provide them with refreshers. Unlike the current model where they might have to find their old textbook and dig in and try and understand where it's at and try to recreate that whole lesson in their own heads, we're going to present it to them as part of their personalized learning path. We've seen this work tremendously well within college algebra. The reason we're convinced that the Adaptive Chassis model and the holistic vertical integration for programs is important and valuable is because in college algebra, for a long time, we struggled with students who were unprepared for college-level work. They might be missing one or two key lessons. [The use of] ALEKS allowed students to go back and find and learn that lesson again in real time so they could continue on in algebra. 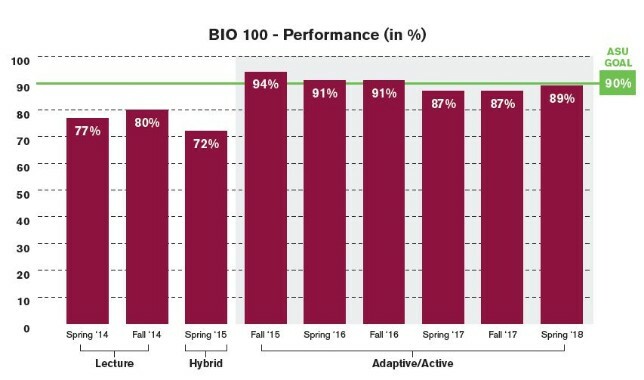 That's why we believe the 20 percentage point gain in our success rate was possible — because the adaptive courseware is providing real-time remediation for those kinds of critical lessons in the learning path. CT: Does that mean you're starting this whole initiative with first-year students in life sciences? Johnson: Yeah. We're going to begin this year with the first year. We've got about 2,400 students who are in the pipeline, so to speak, and we're rolling out each of the successive upper division courses as we finish them. We're trying to stay ahead of them. That's our goal. In the meantime, we're also using the upper division courses we have as prototypes. We can try them out before the wave of students gets to that point. We do have some 300-level and even some 400-level courses that are in use right now. We feel like everyone benefits from the adaptive courseware. They will get an even better benefit — possibly an exponential benefit — from the Adaptive Chassis. CT: What's the process for restructuring either the course material or the instructional practices? Johnson: We have faculty teams that are working on each of the courses to start with. I mentioned the ecology course. We have five instructors there. They've sat down with [Caulkins], and they've mapped out consistent learning objectives. They've also aligned their assessment activities. Now they're actually developing instructional resources. We have four television studios at ASU. We put the faculty members in the studio. We record their video lecture. We then integrate that into CogBooks along with the other materials — reading materials, exercises, interactive games. All of that gets loaded into CogBooks. Our faculty are really at the center of this process, both in terms of defining what the students need to know and developing all of these instructional resources. Our ultimate goal is to make the BioSpine available to the biology learning community at large. So that other universities can join in this effort. We think that it's likely that other places where they've had a high degree of dropouts from their STEM, and their biology degree specifically, could benefit from a similar kind of integrated curriculum. If we can demonstrate that the results are better here at ASU, then we can feel confident that when we share it with the rest of the biology teaching community, it'll be beneficial to them as well. CT: When you talk about sharing it, are you talking about the framework or the actual contents? Johnson: Both. Think of this as a platform that can be updated and modified in real time. I think of it as a living organism, not as a static object. The challenge a lot of faculty struggle with today is that they have a lot of instructional resources that are fixed, like textbooks, that are reviewed and revised every two years. We think, given the dynamic nature of science and a lot of these degrees, like biology, that we really need a dynamic platform that responds to that. Let's say there's a faculty member at the University of Minnesota, who also teaches [an ecology course]. They'll be able to review our learning objectives and suggest changes or add new ones. They'll also be able to review the instructional resources and assessment activities and provide their perspective and/or their version of that content for the community. Eventually, we see this as a living resource for biology educators all over the world. CT: Does that mean institutions would invest in the development effort? Johnson: [Funding could come from organizations] like Unizin or Internet2. Also, we have to be thankful to the Gates Foundation. They've provided us with funding to get our initial efforts off the ground. We absolutely have to thankful to ASU and the academic leadership here that's provided the funding for positions like Josh's and mine and provides support in instructional design services on our side. Each of the players has really been standing up the original prototype through these creative financing efforts. But we think long-term there should be something more stable, so that the operations don't require large infusions of cash periodically from philanthropic organizations. CT: Way back when, adaptive tech was used to test student knowledge: Does the student understand a concept? If not, then back off on the difficulty. If so, accelerate it a bit. This seems like a far cry from that. Johnson: We've gotten much more sophisticated. What you're describing is one of four techniques that I've identified as the core of the adaptive platform approach. I call that the "assessment" technique. It's common in ALEKS and other early systems. The assessment provides the primary information to guide the recommendations for instructional resources or further assessment. That's still a very strong and powerful tool. Three other techniques have been added to that. "Agency" [is] where we're asking the students what they think of the learning process and what they would like to learn next. So you start to open up a conversation with the learners that wasn't possible in any of the technology before. It's amazing what you find out about what they want to do and how they want to learn, or what approach they'd take to the learning process. The third technique is something I call "association." That's really the infrastructure that we're building in the BioSpine, aligning all of the learning objectives and all of the other material so that we'll have a map to guide the learner to the final destination, which is the learning outcome from a particular course or particular exam or particular project. In the final evolution of these techniques, the fourth is the "algorithm." We hear a lot about artificial intelligence and machine learning. That is the hardest one and that is really the culmination of the other three. The data we can gather from the Adaptive Chassis will allow us to develop an algorithmic approach to this. We're thinking about this as a three- to five-year time horizon, enough to get a first working version fully functional and start collecting data on how it's working. Then as we talk about allowing others to join this community, we want to be able to use the volume that comes from that collaboration to generate more data to give us better algorithms. The market is moving quickly to capture all of these different data streams and all of these different techniques. Eventually, we will be at a point where we can use the machine learning and artificial intelligence to assist the students in that learning process. CT: What's that life sciences program going to look like in three to five years compared to what it looks like today? Johnson: It will look dramatically different. It will be all problem-based interaction in the classroom and all adaptive instruction online. It started about 16 months ago with our initial course development efforts in spring 2017. We expect to be done with the first iteration, version 1.0, by fall 2019. Then we're going to go into a continuous quality improvement process, [where] we think we'll need another year-and-a-half to get enough information to adjust any of those courses and align the learning objectives throughout the program. By, let's say, spring 2021, we would hope to have not only a fully integrated and aligned degree program but also several years of data to indicate how students are doing in that program. We have other chassis that we're starting to develop. We're planning a fully integrated undergraduate business degree and also one in engineering. Those are two majors that have fairly high drop rates within their degree pipeline. If we can change the first- and second-year experience in those two majors along with biology, we think we will have adjusted a lot of the "killer" courses that traditionally eliminated students from those degree programs. We think of this as a transformation away from a mass-production model to a mass-personalization model. For us, that's the big win in this whole process. When we move away from the large lectures in that mass-production model that we've used for the last 170 years and get into something that reflects each of the individual learners' needs and can personalize their learning path through the instructional resources, we will have successfully moved the education industry to the new frontier in the learning process. We think that mass personalization has already permeated every aspect of our lives, from navigation to entertainment; and education is really the next big frontier.